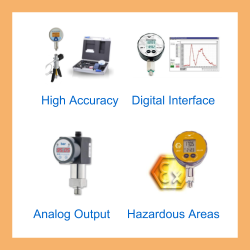 Gauge reference pressure is a pressure measured relative to atmospheric or barometric pressure. The most used pressure reference is gauge pressure which is signified by a (g) after the pressure unit (e.g. 30 psi g), and means that the pressure measured is the total pressure minus atmospheric pressure. There are two types of gauge reference pressure which are called vented gauge (vg or g) and sealed gauge (sg). 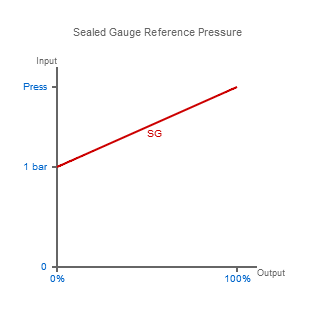 Thus a vented gauge reference pressure sensor should always read zero pressure when the process pressure connection is held open to the air. A sealed gauge reference is very similar except that atmospheric pressure is sealed on the negative side of the diaphragm. This is usually adopted on high pressure ranges such as hydraulics where atmospheric pressure changes will have a negligible effect on the accuracy of the sensor so venting is not necessary. This also allows some manufacturers to provide secondary pressure containment as an extra precaution for pressure equipment safety if the burst pressure of the primary pressure sensing diaphragm is exceeded. There is another way of creating a sealed gauge reference and that is to seal a high vacuum on the reverse side of the sensing diaphragm. Then by adjusting the electronics the output signal is offset by 1 bar so the pressure sensor reads close to zero when measuring atmospheric pressure. 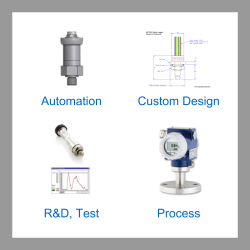 Send us your enquiry for a product associated with this Gauge Reference Pressure page, and get assistance with selecting a product for your application.